Glad to be a Girl: Have a Good One! In very annoying news, my eye has not improved much (even with the help of some anti-histamine pills I've taken). Aargh. At least it's not nearly as noticeable as it was ... at least that's what I'm telling myself. It's more just providing me with discomfort as I look down at my keyboard. So, I hope all of you readers have a fantastic Xmas, if you're celebrating. And if you're not ... enjoy the long weekend :) See y'all next week (I'm planning to work a few of the days to try and regain some leave lost during my marathon November trip!). 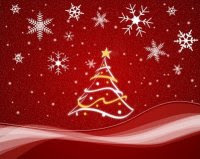 I wish you and your family a "Merry Christmas !" Have a nice christmas time ! I can't believe how many times you get locked out of your office! Have a lovely time on the farm! Merry Christmas to you and your loved ones! Hope you have a great time at the farm. Ps! Oh yeah, before I forget - not sure exactly what's wrong with your eye but sometimes for a scratchy eye it helps to do the following: take a rooibos tea bag and rinse it out under first warm water and then cold water. Press the worst of the moisture out and then whack the whole teabag on your eye, when it starts heating up from your body heat just turn it over. It's really very nice, trust me. ;-) Hope you feel better soon. @all - thanks for the xmas wishes :) Hope you all had a good one too!